An Orocos component is built upon the Real-Time Toolkit (RTT) library. It allows you to build components which are accessible over a network, configurable using XML files and listen to a scripting interface, which allows components to be controlled using text commands. A component which accesses IO devices can use the Orocos Device Interface as well which defines how to interact with analog and digital IO and encoders. Of course, components can make use of external, non-Orocos libraries as well. 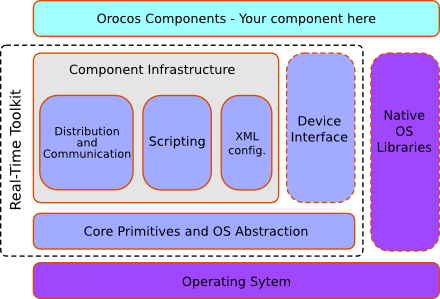 Orocos components which only use the Real-Time Toolkit are portable over different Operating Systems (OS) and processor architectures. Orocos has an internal OS abstraction which allows the components to run on any supported architecture. When your component uses an external library, for example a camera or vision library, portability depends on these libraries.